A sales fair was conducted by the department of Management studies to promote the entrepreneurship skills of the budding entrepreneurs on 4th and 5th October 2018. The sales fair was inaugurated by the Principal Dr. N. Mohamed Sheriff on 04/10/2018. A. Keerthiga Jency of second MBA delivered the welcome address. Students from all departments participated in the sales fair and made it a grand success. The management students exhibited their marketing skills managerial skills and extended their services to their customer. In the valedictory session held on 05/10/2018 the students were given several awards in appreciation of their business skills. The award for the best entrepreneur was given to Nadar Bharat Laxman of II MBA. The best salesperson award was bagged by M. Eswari, M. Muthulakshmi, G. Nelson, T. Saravanakumar and S. Jensingh of II MBA. The best customer whisperer award was given to S. Vijayarani and S. Pechimuthu (II MBA). The Best Innovator Award was given away to T. Paramakrishnan (II MBA). S. Kalanandhini and S. Kiruba John received the Best Supporters Award. 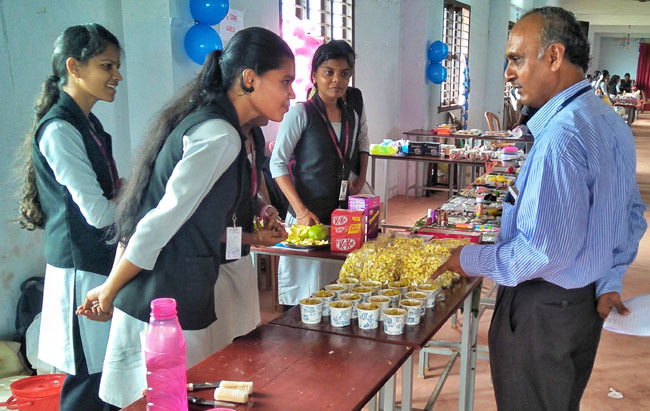 The Principal in his valedictory address highlighted that theoretical learning of marketing skills alone will not suffice to become successful entrepreneurs such Sales Fair would help the students gain practical skills. The Principal congratulated the prize winners and appreciated the efforts taken by the department. G. Gnana Prakash of II MBA delivered the vote of thanks.